We’re in part five of my Platform on WordPress series of posts. 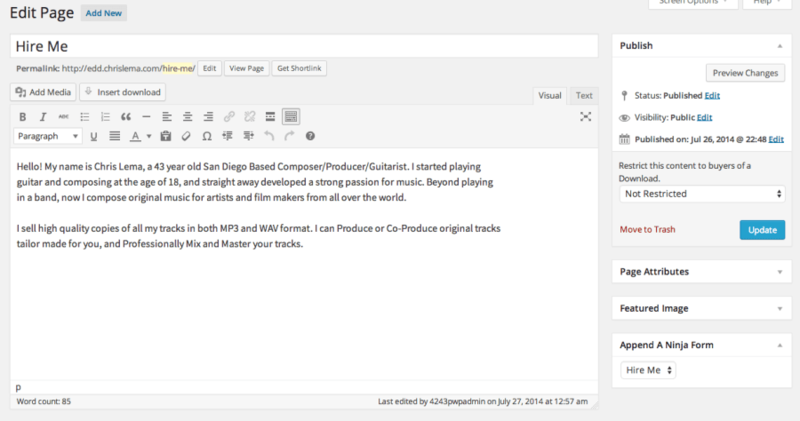 And today I’m going to walk you thru building a band or musician’s site, using WordPress and Easy Digital Downloads. But in case you’ve missed it, here are the previous posts. In that first post, I told you that you needed more than just a website – more than just text, images, and a tiny bit of interactivity. I then told you, in the second post, about the different kinds of platforms you might consider. And since I covered Fan Clubs yesterday, today I’ll show you a different approach. But now that we know our target, let me tell you about some of the tools we’ll need. While yesterday I didn’t go into themes at all, I would be completely skipping over a bit of awesomeness if I didn’t tell you that there are some beautiful themes available for Easy Digital Downloads. So today I’ll be working with Marketify. It’s amazing. I also purchased one other plugin, to show you AffiliateWP and its simple integration with Easy Digital Downloads. When you add it all up, the total was under $300 (including the theme). Not bad, if you’re building the platform that will help you grow your audience, right? One of the nice things about Easy Digital Downloads is that it’s easy. I know. Basic, but true. So yes, Pippin and his team have written documentation on setting things up, and even have an installation guide, but I’ll be honest with you, I doubt you’ll need to read them. Because everything is really straight forward. In fact, other than uploading and activating all of the plugins above, there are only a few spots you need to configure things. If you added the Stripe gateway, you’ll want to head to Downloads > Settings and go to the Payment Gateway tab. There you’ll see a spot for checking the Stripe box, and then lower, you’ll be able to put all your keys (that you get from Stripe). Another area you’ll want to visit is the Extensions tab, to configure your connection with MailChimp. 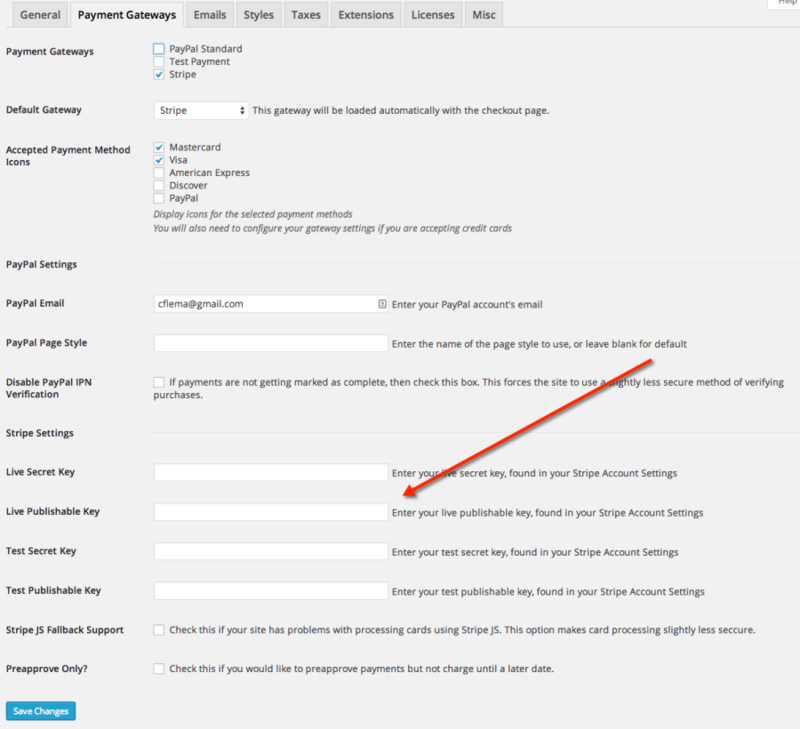 Before you do that though, make sure you get your API credentials from MailChimp – which means heading to their site and looking into your Account under Extras. There you’ll see your API key (or will be able to create one). 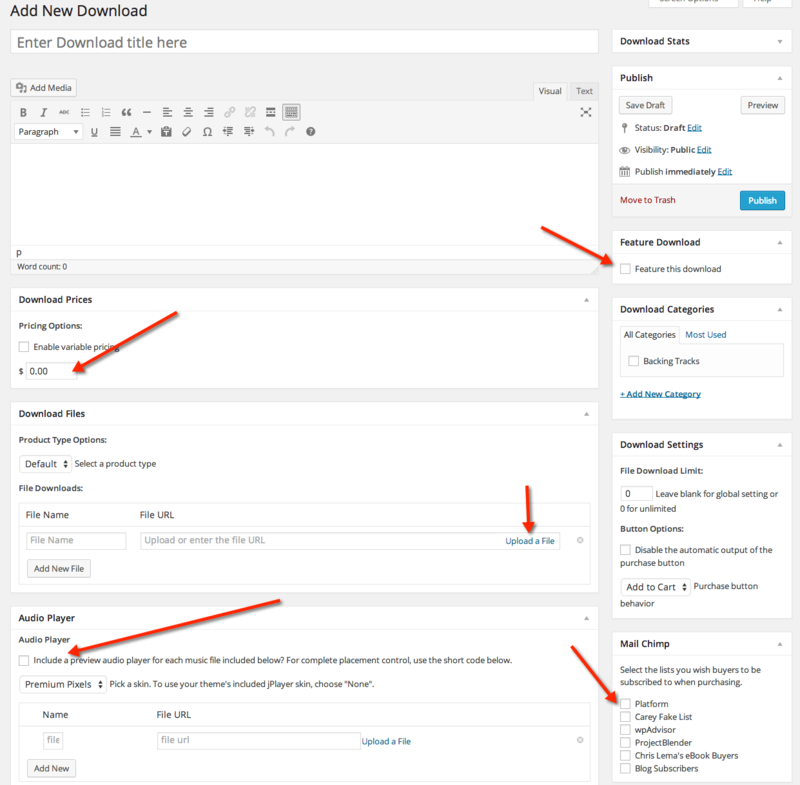 When you have it, come back to WordPress, and under Downloads > Settings > Extensions, you’ll see the place to put it. One of the other things to do, when we’re talking about extensions, is to hit that License tab and put in all the keys you got emailed when you purchased your Easy Digital Downloads extensions. I’m not saying you have to have an affiliate program. Don’t get me wrong. But if you’re selling something online, it makes some sense, if you do it right, to make it easy for others to be brand ambassadors for you. If they’ve bought your products, liked them, and want to recommend them, isn’t that a good thing? But, if you do it wrong, or aren’t careful, you can just end up giving money away. That’s why it’s important to pay attention to your metrics and more. But this isn’t a post about affiliate marketing. I simply want to show you how easy it is. Integrating AffiliateWP with EDD is simply a single click. That’s it. You’ll find that after you activate the plugin and go to Affiliates > Settings. Those three tabs are all you have to configure, and it’s all very straight forward. Another note about the program is that in my sample, I didn’t put it in the main menu. But I did put it in a custom menu in the footer of the page. I told you about the affiliate plugin early in the process because after you set it up, there’s nothing left to do with it. That meant we could get right into the key pages of our example. One of the pages is a version of a contact page. 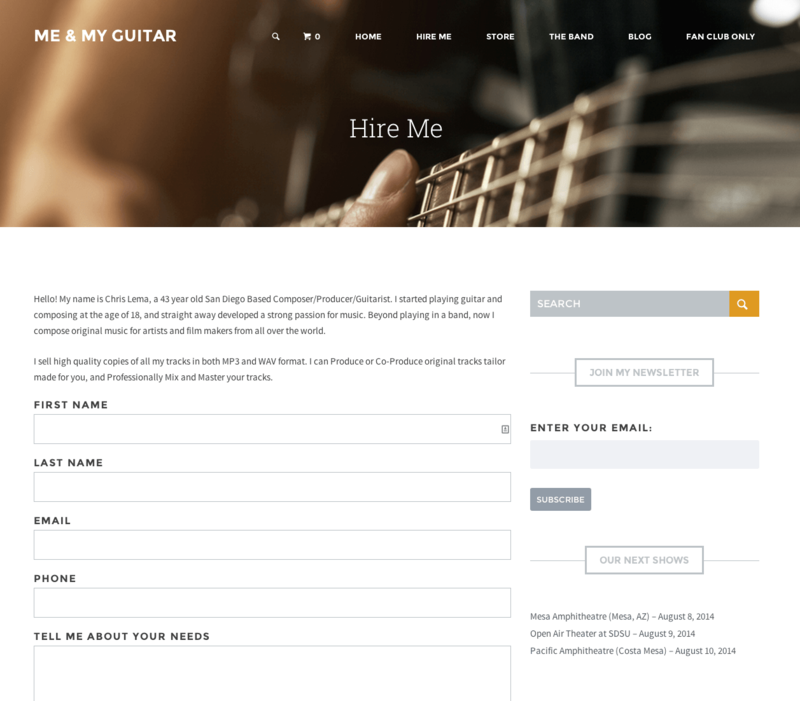 It’s specifically set up with a form to be a “hire me” page for a musician who either, in my example, creates custom backing tracks with his guitar, or can be hired to come out and play for other musicians in the studio for recordings. What you’ll notice is two things right away. First, the page has a nice image at the top as part of the background – that’s completely Marketify. Once you add a Featured Image to your page, it drops it in. Pretty nice. Second, after some text, you see a form. Forms are easy to build and in this case, I used the free Ninja Forms to build a simple intake form. Let me walk you thru the three steps in creating that form. First, go to Forms > Add New. Fill in the info. Notice the “Add form to this page” section. You can fill this in, like I did. Or I’ll show you another way. 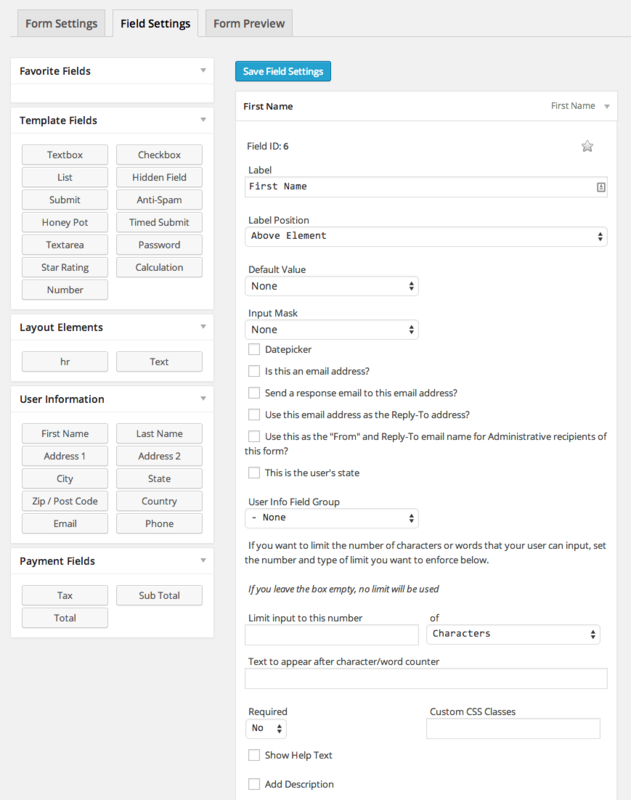 Second, click on the Field Settings, so that you can add the fields to your form. Clicking on each field on the left (like First Name, Last Name, etc) will put them on the right, showing you all your options. Most of them are all pre-done, so you don’t have to worry. One thing to note – remember to put a Submit button on your form, or no one will be able to submit your form. I remember making that mistake once. Ugh! 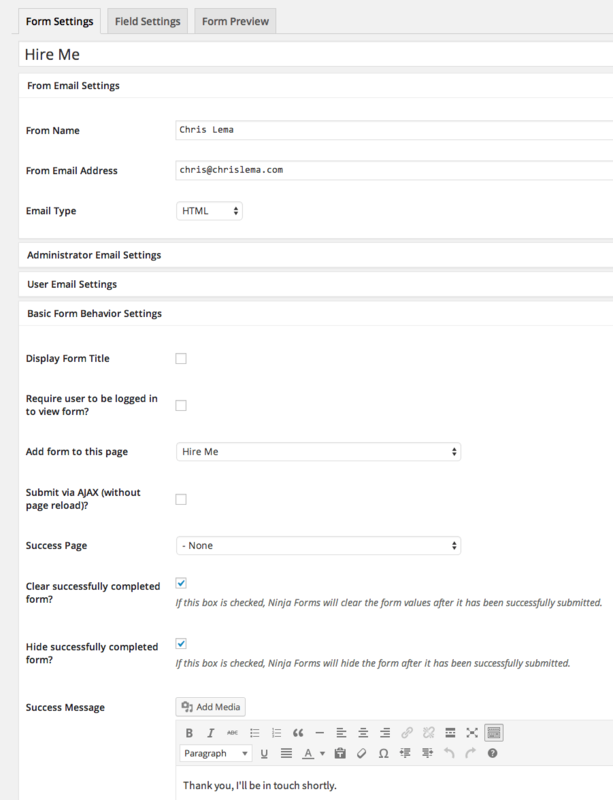 Lastly, if you didn’t append the form to a page, you can go to the page and do it there. See it on the bottom right? It’s that simple. Wait, what about all that other stuff? You likely also noticed that on the Hire Me page, on the right side (called the sidebar), there’s other stuff. The search is pretty straight forward, as it’s simply a widget that you can add to the Sidebar area under Appearance > Widgets. But that Newsletter sign up bears talking about for a second. As does the upcoming events. I mentioned before the use of Mailbag to collect subscribers to your list. Well, setting it up is easy. 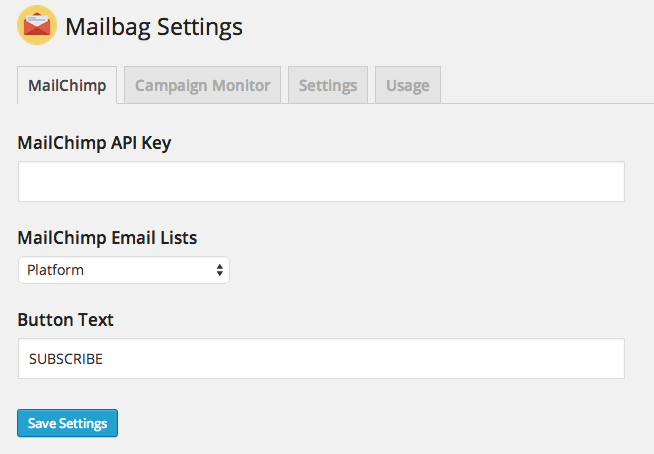 Activate the plugin and then go to Settings > Mailbag and on that first tab, put in your API key (remember, the same one from before when you looked it up at MailChimp). Then go look at the Usage tab and you’ll see this shortcode “[mailbag_mailchimp]” which you can put into a widget and you’re all set. When we looked at the sidebar of the Hire Me page, you likely noticed a list of upcoming events. It’s a widget that comes with Sugar Event Calendar – another plugin that Pippin wrote. As I wrote about the other day, if you wanted to sell tickets, you could use Event Calendar Pro and their extension for selling tickets that integrated with Easy Digital Downloads. I didn’t do that in this example, because most of the artists I know use third party services to manage ticket sales. But it’s possible. With Sugar Event Calendar, you simply add events – giving it a name, some text if you like (for the details of that event), a date, and start and end times. That’s it. The result is apparent on the The Band page (using a shortcode on the page, and the widget in the sidebar). With our Hire Me and The Band pages done, it makes sense to get on to the Store, right? And that means doing what we came here to do – work directly with Easy Digital Downloads. It looks good because our theme makes it look good. But it’s easy because the plugin makes it easy. Once you create your store page, you simply pick the Store template (on the New Page screen, on the right hand side) and it presents all the available downloads for you. But let’s go deeper and create a download to show you how we got these three here. Head to Downloads > Add New and you’ll see a screen just like this. I’ve highlighted all the key spots. Let’s look at each. 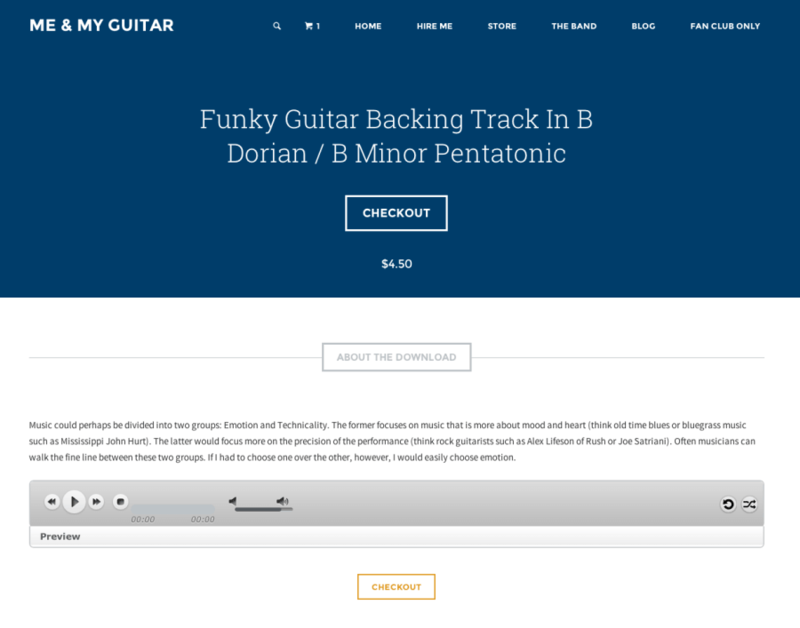 First, if you want the digital download (in this case, audio files for sale) to show up on the home page, here’s where a free Featured Download extension for EDD is nice. It gives you that featured check box you can mark. Second, remember to set a price. Third, upload the digital file. In this case it would be the full mp3 file of the backing track I’m putting up for sale. Fourth, use that Audio Player to showcase a bit of that track. This means you want to upload a second mp3 that is shorter (say 10 or 15 seconds). And check that box to include the preview (above or below the content). Lastly, because of the MailChimp extension, you can now offer buyers of this product a chance to join your list. On the checkout page it looks like this. Of course you don’t have to make it say “Get Updates” – you can make it say anything you want. But what’s nice is that it’s part of the checkout process – making it easier for people to sign up. When you save this download, the result is a simple and easy to use product page. We’re almost done, but not quite yet. Remember that I told you I was going to show you a different approach to a fan club than I did in yesterday’s post. Yesterday I looked at what it would be like to create a fan forum, where people were engaging each other and you just wanted to protect access via a membership component. Well today I want to help you think about it differently. 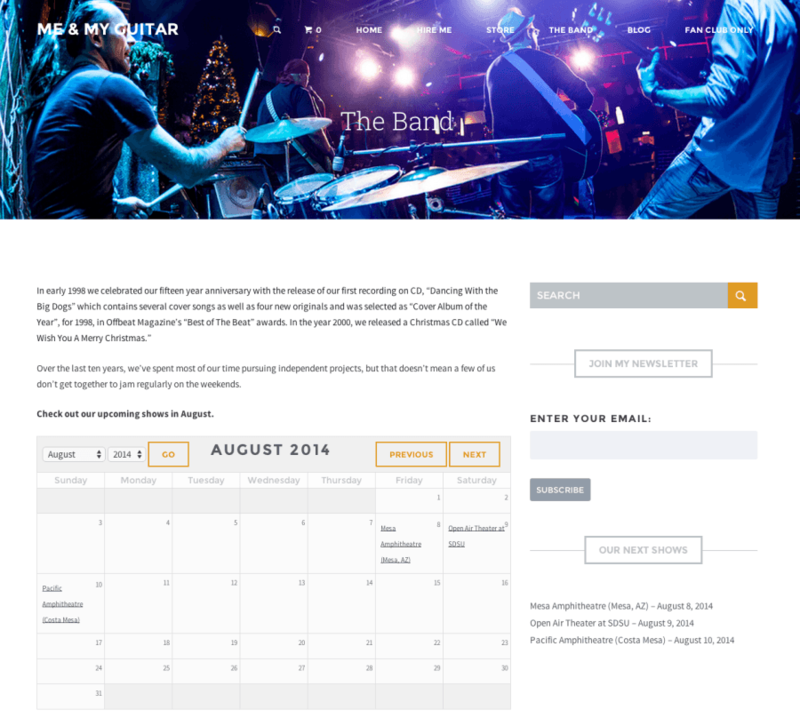 And this becomes valuable even outside of this setting (a musician’s site). One way to define a fan, in a very real sense, is someone who has bought your stuff. I know, pretty basic. But watch how that becomes a really simple way to think about protecting pages. I created a new page, called Fan Club Only, where I imagined putting special free download links, a video, and maybe more. But I only want people to be able to get to that page if they’ve bought my big ticket item. What you see is that Easy Digital Downloads gives me that very feature, via an Extension called Protected Content. It gives me that little drop down to pick from, so I can make sure that the only people who see this page are those who bought the product I wanted them to. You could create a private page per product (almost like iTunes gives you access to digital downloads if you buy certain movies). Or you could create a single page when a big ticket or specific item is purchased. And of course, the item purchased might just be the fan club access itself – if you want to charge for it. Well we made it. You got to the end of another Platform walk thru and hopefully you’re noticing three things. The truth is that there are many ways to think about how we build a feature (like the fan club). Picking the right tools, like Easy Digital Downloads and its extensions, makes this really easy. Knowing what tools are available (including extensions) really helps you speed up your efforts. With that, I’ll sign off and wish you luck. And again, like yesterday, if you need help building things like this, hit up my contact form and I’m sure I can recommend some friends to help you.